Dolby Atmos sound can elevate your movies and shows — literally, by adding a height dimension. Dolby Atmos sound can elevate your movies and shows — literally, by adding a height dimension. It's made believers out of many of us home theater fans here at Crutchfield. But not everyone has the space for a full Atmos home theater setup. Enter the Samsung HW-K850 sound bar. This bar and sub combo fits neatly into your living room and delivers three-dimensional Dolby Atmos sound, including exciting overhead effects. Samsung designed and developed this sound bar in their new state-of-the-art audio lab in California. It's a pretty ambitious feat. Just consider that Atmos was originally developed for movie theaters with dedicated in-ceiling speakers. Samsung's audio experts were up to the task. The HW-K850 is an easy way to enjoy the immersive experience of Atmos. 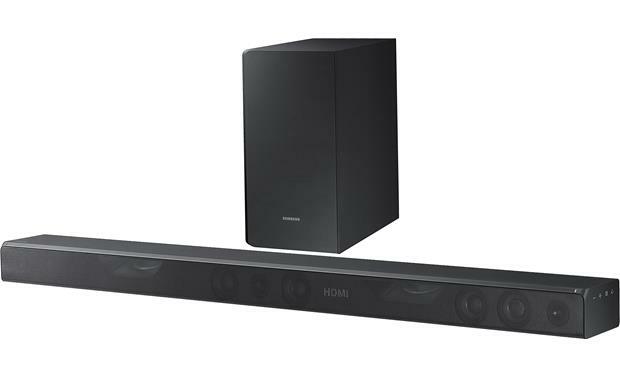 You can add wireless surround speakers and even more overhead sound with the Samsung HW-K950 sound bar system. The sound bar measures just above three inches high, and can be wall-mounted or placed on a stand below your TV. You can connect it to your TV via HDMI. The bar has 11 built-in speakers, including a series of full-range drivers and tweeters to cover the front stage (left, center, and right). 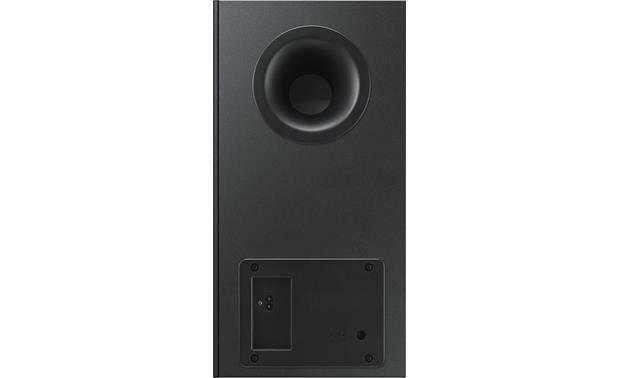 There are also two up-firing drivers that reflect sound down from the ceiling toward your listening position, to expand the soundstage and create overhead effects. Samsung's special processing can add height to movies and TV show soundtracks, whether they're mixed for Atmos or not. The included eight-inch subwoofer adds hard-hitting bass and connects wirelessly for a clean, convenient setup. You might invite friends over to show off the HW-K850's movie sound, but they can stick around for some tunes. Wi-Fi lets you play music wirelessly using the Samsung Multiroom app for Apple® or Android™. You'll have access to your music downloads, as well as streaming services like Pandora®, Spotify®, and more. With just a few taps of your thumb, you can fire up a sweet playlist while you prepare snacks or mix drinks for your guests. The '850 also communicates with Samsung Radiant360 speakers (sold separately). You can place these speakers in other rooms and control them all with the same phone or tablet. As an added bonus, you can even use a pair of them as surround speakers, giving you full wraparound Atmos sound without running wires. The Samsung HW-K850 also features built-in Bluetooth. This means you can stream audio from pretty much any mobile app you want — including YouTube® and SoundCloud — through the system. It also makes it easier for your guests to pair up if they have something they want you to hear. I recently purchased the Samsung HW-K850. It appears the Dolby Atmos only functions with an HDMI out port from the TV. Mine only has the optical output. Is there a work around for this? NO I only think it takes hdmi cable connection. 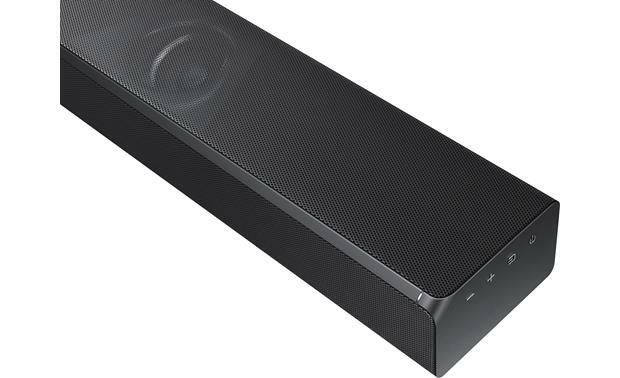 Dolby Atmos Enabled Soundbar Speaker System: Samsung's HW-K850 soundbar speaker system delivers Dolby Atmos sound from a Dolby Atmos enabled active soundbar speaker and a wireless powered subwoofer. Now, you can experience sound that comes alive from all directions, including overhead, to fill your home theater with astonishing clarity, power, detail and depth - without having to install over-head ceiling speakers. The HW-K850 is capable of delivering up to 3.1.2-channel Dolby Atmos sound. Active Soundbar Speaker: The HW-K850's active soundbar speaker incorporates 11 drivers that include forward facing center, front left, and front right channels, along with upward firing Dolby Atmos enabled channels. The soundbar speaker's dedicated center, front left, and front right channels each consist of one tweeter and two midrange drivers. The two dedicated Dolby Atmos channels each consist of one upward firing full-range driver. All 11 drivers are powered by a built-in 198 watt amplifier (18W x 11ch, 4-ohm, 10% THD). Wireless Powered Sub: The wireless subwoofer is outfitted with a side-firing 7" woofer inside a bass reflex enclosure with rear-firing port that is powered by a built-in 162 watt amplifier (162W x 1ch, 3-ohm, 10% THD). You can independently adjust the volume level of the subwoofer from -6 to + 6, without interfering with the system's overall volume level. The wireless powered subwoofer receives its audio signal wirelessly from the soundbar via 2.4GHz transmission. There are no cables to connect, except the AC power cord for the sub. You can place the wireless powered subwoofer up to 32.8' away from the soundbar. The wireless subwoofer is automatically connected to the soundbar through auto-pairing. Note: To enjoy Dolby Atmos you most connect your Blu-ray player's HDMI output directly to the HDMI input on the HW-K850, because your TV's HDMI ARC jack will not support Dolby Atmos. Sound Enhancements: The Samsung HW-K850 offers a variety of audio adjustments to enhance the system's sound and your listening experience. 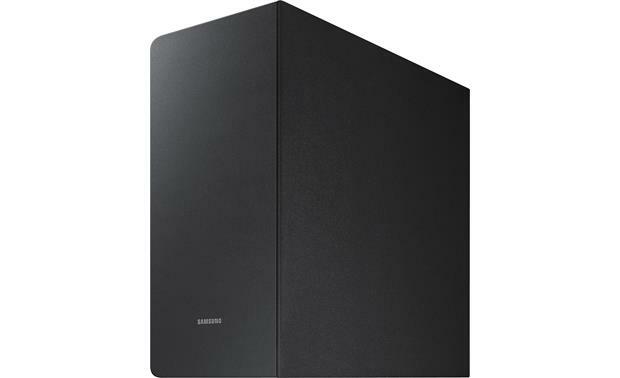 Surround Sound Expansion Plus: Samsung's proprietary Surround Sound Expansion Plus technology upconverts audio content to up to 3.1.2 channels, adding overhead sound dimension to virtually anything you watch. Sound Effects: The Samsung HW-K850 offers 6 different sound effects modes (Standard, Music, Movie, Clear Voice, Sports, & Night), depending on the type of content you want to enjoy. The Clear Voice mode enhances dialog and vocals, while Night mode compresses the dynamic range of the soundtrack. Bass & Treble: You can adjust the system's Bass & Treble independently from -3 to +3. DRC (Dynamic Range Control): Lets you apply dynamic range control to Dolby Digital soundtracks. Analog + Digital Inputs: The Samsung HW-K850 wireless audio soundbar system features both analog (3.5mm) and digital (optical) audio inputs. 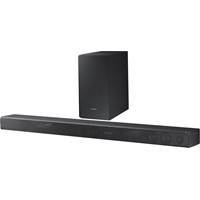 Optical Digital Input: The Samsung HW-K850 wireless audio soundbar system's soundbar is equipped with an optical (toslink) digital input to connect your television, Blu-ray/DVD player, or satellite/cable box. The digital optical output terminals of many newer flat-panel TVs only send a Dolby Digital audio signal when receiving Dolby Digital surround sound from the TV's built-in tuner, network connection, or connected USB device; and will output only 2ch PCM from sources connected to the TV via HDMI, or RCA (like your Blue-ray/DVD player or satellite/cable box). Aux Input: The Samsung HW-K850 's soundbar features a stereo audio minijack (3.5mm) input to connect your analog television or other analog audio component. 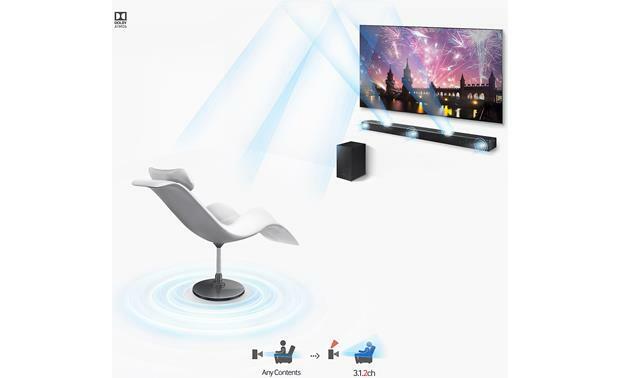 Note: To get the best audio performance out of the Samsung HW-K850, use the system's HDMI inputs and optical digital input to connect your Blu-ray player, satellite/cable box, and game system. Then connect the system's HDMI output to your TV's HDMI ARC input. By connecting your Blu-ray player and satellite/cable box directly to the soundbar system, you'll gain Dolby Digital/DTS decoding from these two sources. Optional Wireless Rear Speakers: Via the wireless multi-room app on your smartphone, you can even wirelessly connect a pair of Samsung Radiant360 Speakers (sold separately) with the HW-K850 soundbar speaker system to create a 5.1.2ch surround sound system over WiFi. Simply place the soundbar speaker in the front and two Samsung Radiant360 wireless speakers in the rear while following the setup on the multi-room app for a 5.1.2ch surround effect. HDMI 2.0: The Samsung HW-K850's soundbar is fitted with two HDMI 2.0 inputs and one HDMI 2.0 output (ARC compatible). The two HDMI inputs allow you to connect your Blu-ray player and cable/satellite box directly to the soundbar and then from its HDMI ARC output to your flat-panel TV. The HDMI 2.0 inputs and output support 4K Pass-Through, 3D video, and ARC. 4K Pass-Through: The soundbar's HDMI 2.0 inputs and output can pass 4K ultra-HD video, as well as 1080p, 1080i, 720p, and 480p video. Note: The soundbar does not offer HDR pass-through. If you have a HDMI source device with HDR capability, you will need to connect it directly to your TV. Audio from the HDR source device will be sent back out to the soundbar via HDMI ARC at only 2ch PCM for many TVs (you will lose Dolby Atmos support and may also lose Dolby Digital/DTS capability). HDCP 2.2 Compatible: The soundbar's HDMI inputs and output support HDCP 2.2, which fully complies with the latest copyright protection standard for 4K video transmission. 3D Ready: The HW-K850 can pass through 3D video from 3D-ready Blu-ray players to 3D-ready TVs, via HDMI. You will also need compatible 3D-ready glasses and 3D-video content. Wireless Network Connection: The Samsung HW-K850 offers a wireless (WiFi) network connection which allows you to stream a variety of Internet radio stations, select online music services, and music stored on your smartphone/tablet device or computer/laptop to the soundbar speaker system. It also allows you to setup a multi-room audio system and wireless surround with other compatible Samsung wireless multi-room devices (sold separately). To access these features, you must download the Samsung Wireless Multi-Room App onto your Apple iOS or Android device. Wireless Multi-Room App: Simply download Samsung's free Wireless Multi-Room app from the Apple App Store or Google Play Store onto your Apple iOS device (6.1+) or Android smartphone/tablet (2.3.3+) to stream Internet Radio, select online music services, and your smartphone's stored music library to the Samsung Soundbar speaker system. Online Music Services: You also get access to select online music services; like Pandora, iHeart Radio, Rhapsody, Spotify Connect, and Amazon Music. You can even set presets of your favorite Internet radio stations and online music channels. Music Libraries: You can stream music stored on your compatible iOS or Android device directly to the soundbar system. You are able to search your device's stored music by Song, Album, Artist, or Genre; you are even able to create and edit Playlists. You'll also be able to stream stored music on your Windows or Mac computer and other DLNA-compliant network storage devices to the soundbar speaker. The system supports compressed music files such as MP3 (up to 320kbps), WMA (up to 320kbps), AAC (DRM-free only), & OGG; as well as non-compressed music files like AIFF (up to 96kHz/24-bit), ALAC (up to 96kHz/24-bit), FLAC (up to 96kHz/24-bit) & WAV (up to 96kHz/24-bit). Auto Firmware Updates: If the Soundbar system is connected to the Internet, it will automatically check for the latest firmware and update when new firmware becomes available, even if it is turned off. Bluetooth Music Streaming (A2DP): You can wirelessly stream stored music and music apps from your Bluetooth-enabled device; like your smartphone, tablet, computer, or laptop to the Samsung HW-K850 and enjoy music with high quality stereo sound, all without wires. The HW-K850 does not control your Bluetooth-enabled device; you will continue to control your music from your Bluetooth-enabled device. Song/artist information will also still need to be viewed from your Bluetooth-enabled device. Note: Due to the differences in Bluetooth technology, some Bluetooth enabled devices may be incompatible, function improperly, or may not support all features when used with the Samsung HW-K850. Remote Control w/ Anynet+: The included IR remote control provides wireless operation of the Samsung HW-K850 system. Anynet+ is a convenient feature that offers linked operation with other Samsung components (up to 12) that have the Anynet+ feature, and lets you control those products with one Samsung remote control. To operate this function, you must connect Samsung HW-K850 wireless audio soundbar system to an Anynet+ Samsung TV using an HDMI cable. TV Remote Programmable: The Samsung HW-K850 soundbar system can also be programmed to respond to select TVs remote controls. Once programmed, you can control volume up/down & mute with your TV remote. 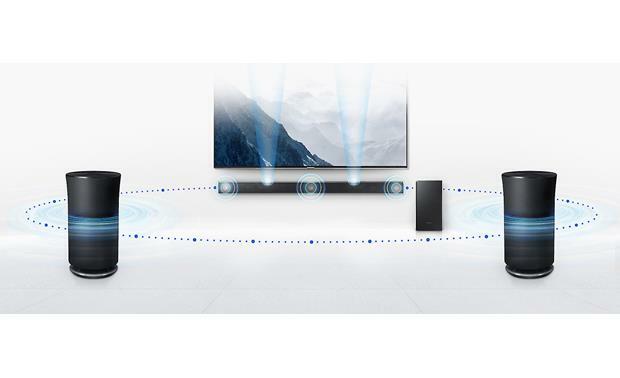 Auto Power On/Off: The Samsung wireless audio soundbar system offers Auto Power On/Off functionality. Auto Off: If a TV or any device connected to the wireless audio soundbar system is off and there is no audio signal, the soundbar system will turn off after 5 minutes. Wall-Mount or Tabletop Mount the Soundbar Speaker: The soundbar is designed to be mounted directly below or above your flat-panel HDTV in a horizontal orientation. It should be placed directly in front of your main listening position with at least 2" of space above the soundbar for the built-in Dolby Atmos-enabled upward firing drivers. The soundbar can be placed on a shelf or table-top. The soundbar also includes wall-mount brackets which allows you to fix the speaker to your wall. 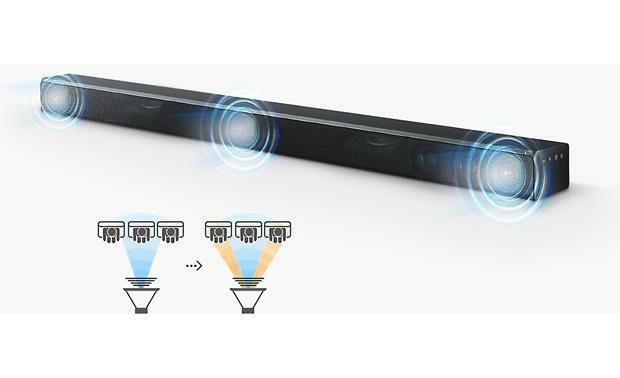 Wireless Powered Sub Placement: Thanks to its 2.4GHz wireless connectivity, you can place the powered subwoofer up to 32.8' away from the soundbar. There are no cables to connect, except the AC power cord. It is recommended that you placed the wireless powered sub along the same front wall as the soundbar speaker. Yes, that is correct. Dolby Atmos is only transferred over HDMI. Optical cables do not send Dolby Atmos audio. The only way I have found to hear Dolby Atmos on the HW-850 is to send the audio directly from the Blu-Ray player (not the TV) to the soundbar via HDMI and play a Dolby Atmos compatible disc.